Robot Arm = Robot Slave | OhGizmo! 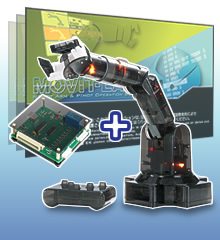 Available from Elekit Japan is a fully programmable and articulated USB robot arm. It has 5 separate motors to control movement including grip, wrist, upper arm, lower arm, and base rotation, and is made of semitransparent plastic with internal lighting so that you can see all of the little whatsits and thingies that make it work. Some assembly (pretty much just a screwdriver) required. Available in a limited edition of 999 in March for just over $80 US… In Japan, of course. Comments closed to do spam. Screw you, spammers.